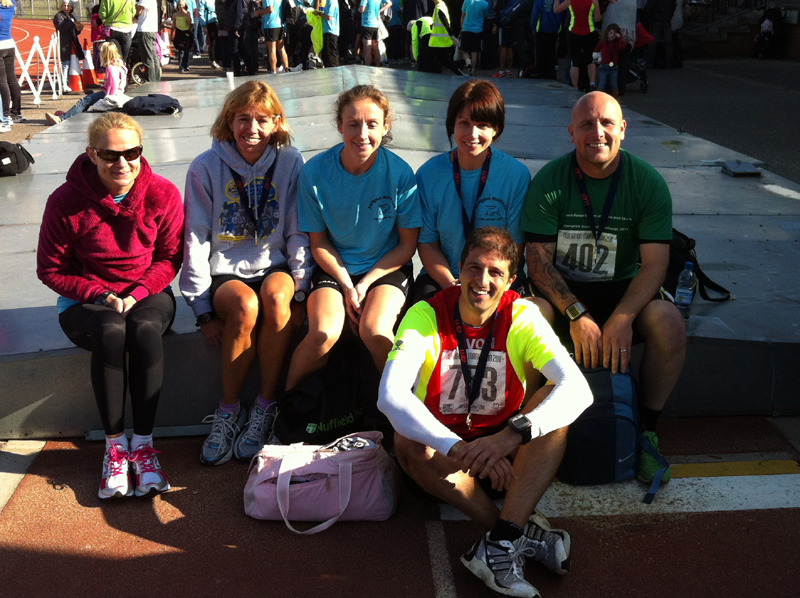 I took part in the 2011 Abingdon Marathon with fellow Fetchies Stouty, Capricorn and a few friends. Conditions were pretty much perfect on the day, which was sunny but cool, and no wind. The pre-race aim had been to go for a new personal best of 3.30 although to be honest the Ridgeway Challenge on August bank holiday had overshadowed this run and I had just been ticking along with my usual weekly mileage. Stouty had been running well recently and I decided to stick with him on the way round. We had planned to run at a 7.45 m/m pace all the way round to give us a small cushion under the 3.30 mark. I spoke to a few Fetchies pre-race (wearing the Fetch top gets you the odd smile and nod of acknowledgement from fellow runners and Fetchies) and we then lined up near the back of the pack on the race track before the start of the race. We probably started a little too close to the back and found ourselves overtaking a few people during the first mile or so. My plan off sticking closely to Stouty worked well as we took a combined “comfort break” within the first 2 miles together. After that we started to settle down into a rhythm with our first 10 mile splits 8.08, 7.56, 7.38, 7.54, 7.38, 7.38, 7.40, 7.42, 7.46, 7.41 so we were pretty much spot on our planned pace. I took an energy gel around mile 12 as we pressed on hitting the half way mark at around 1.40 which gave me 1.50 to do the second half of the race, so a 10 minute comfort zone. Our next 5-mile splits were 7.30, 7.37, 7.29, 7.37, and 7.29 so very slightly quicker. We passed the Fetchpoint, which was awesome, very well supported with loads of load verbal encouragement. Well done to the lady who kept raising her top to show her Fetch t-shirt, I assure you that’s all we were looking at! The best moment of the race for me occurred just around the start of the second lap with a large group of supporters spied the “Avon” name on my top and started to give me some personal encouragement by cheering “Avon, Avon, Avon”. It was a great motivator (I felt like Marcus Aurelius at that point) and basked in a small moment of personal glory until I passed another supporter who commented, “It didn’t make you run any faster, did it?” – thanks! It felt as if Stouty was starting to push the pace a bit around mile 15 and I had to make a bit of an effort to keep up. The next 5-mile splits were 7.31, 7.24, 7.28, 7.26, and 7.23 so incredibly we were speeding up. I popped another gel at this point more for the placebo effect than anything else and gulped down some water from the regular checkpoints. We hit the milestone 20-mile point and could then start counting down. However, at this point the run really started to feel like more of an effort. My legs felt tight and I lacked the ability to stretch them out so carried on shuffling as best I could. At mile 21 (I think) we reached Fetchpoint again which was a great motivator but then Stouty called out he was going to grab a gel and started to slow down. I gave him a nod, said, “catch me up” and plodded on. Without a bit of company and with various aches on my right leg (previous calf niggle was coming on and my quad was really sore – not sure why as my left was fine) I felt as if I was really struggling here. 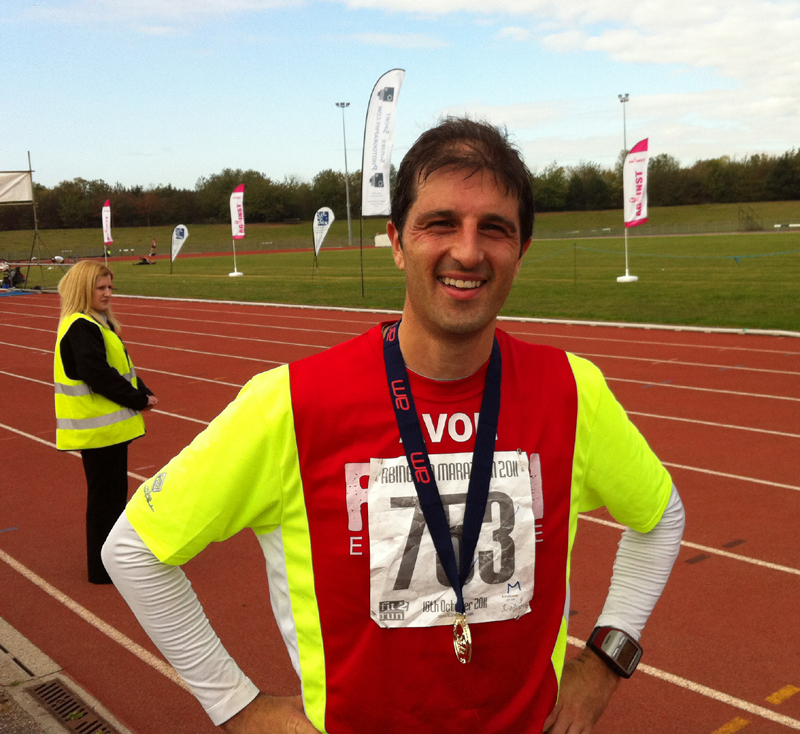 My 21 – 23 mile splits were 7.38, 7.35, 7.53 so the pace had slowed slightly but still under the planned 8m/m. I hit the 23-mile mark under the 3hr mark and at that point knew that even if I slowed to 10 m/m, I would make a sub 3.30 time. If I maintained my current pace then the time just gets better and better. Despite that comfort, the last 3 miles were tough both mentally and physically and I think a lack of recent long runs were telling. I kept shuffling along overtaking a small handful of people but not at any great pace. The final 3-mile splits were 7.53, 8.09 and 8.08 although despite telling myself not to walk, stopped briefly to grab and drink some water at the last checkpoint. The road towards the sports centre seemed long but eventually you crossed the road and then had to follow the path on a small loop outside of the sports centre before they finally allowed you to finish on the track. Mentally, I was just wishing this was over now and tried to inject some positive thoughts by thinking about my sprint finish. I plodded into the stadium did the half a loop of the track and then made a sprint finish effort and crossed the line in 3.22, a new PB by 13 minutes! To be honest, I wasn’t feeling that elated. Perhaps the tough last few miles had affected my outlook of the race and I felt glad it was over as opposed to being happy about my best ever marathon performance although I did start to feel some satisfaction later as I watched the others coming in. I think I get more satisfaction in finishing a longer Ultra than a more effort intensive run (you can always walk a bit in an Ultra right?). Stouty finished a couple of minutes behind me in 3.24 and then Nina came in 3.30, Sue (Capricorn) finished in 3.33, Harriet in 3.37 and EJ in 3.43 so some really good performances all round from everyone. 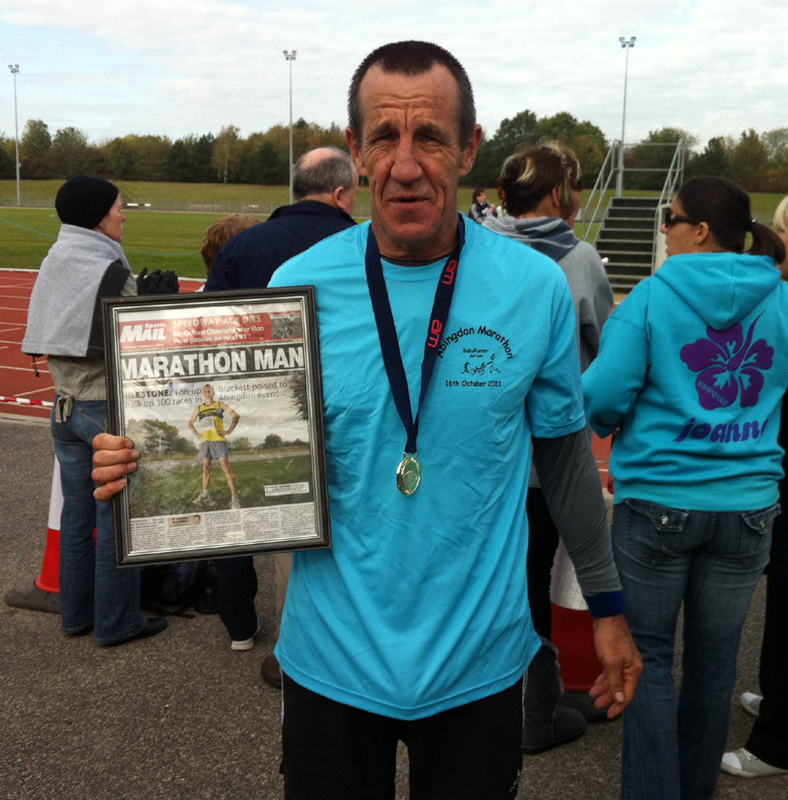 We also spotted Blackbird Leys Boy who completed his 100th marathon today! 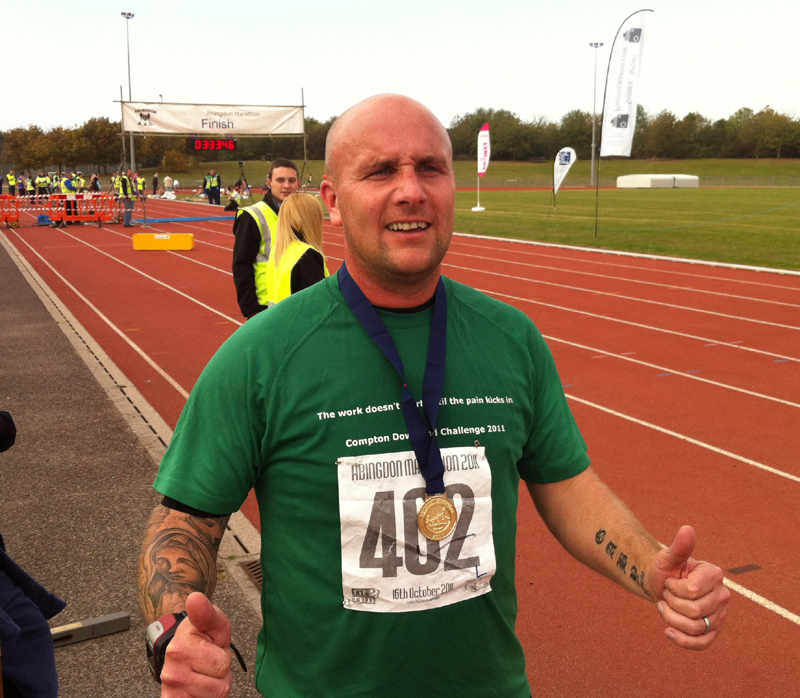 And a quick mention to Run Forest Run who set a new PB of 3.31 if I recall correctly. Conditions were absolutely perfect today, weather was fantastic, the run was fast and flat and the marshalling was excellent. There were loads of marshals supporting the race and they were both helpful (i.e. never an issue crossing the roads) and vocal in the support. If you are looking for a fast marathon performance then this race ticks all the boxes really.